Happy Flippin New Year Ya’ll!! Yesterday, on New Year’s Eve, I read lists and lists and lists of New Year’s Resolutions. Some were pretty standard ~ Lose Weight, Save Money, Get a New Career, Get Married/Divorced/Together/Separated, Quit Smoking, Exercise…..
And then some were a little more ambitious ~ Travel the world, Get Pregnant, Write Book, FIND Husband (is he lost??? ), Build House…. And then I thought about mine ~ and again resolved NOT to write New Year’s Resolutions because I will ALWAYS break these Resolutions before the end of January and, since I’m pretty lazy, I hate to waste all that time writing them if I’m just gonna break them in a few weeks. Find the last 20 years worth of calendars/planners and put them all in the same place. Right now, they are in 20 different places and I can usually only find 2 or 3…last year when I needed my medical history for a new doctor, I totally made up surgery dates. I’m thinking 1996 is close enough to 2006, right? Throw away 87 pairs of socks that I never wear and/or have holes in them. I’m positive I won’t wear the Winnie the Pooh socks my Disney-employed girlfriend got me in 1992. Find someone who cross-stitches and give them my thread, patterns, material and needles I used to start the teddy bear themed picture in 1985. I think I have the ears and nose done, but it’s been a few years and I’m not sure if I even got to the nose. And there’s a very good chance that thread is rotten…. Admit I’ll never wear those size 12 jeans stored in the bonus room. I’m not quite ready to give them away, but I hear admitting I have a problem is the 1st step. Clean out my office and actually USE it for something more than clutter storage. If we need to clean off the table/kitchen island/living room tables or anything else, I’ll just ‘put it in my office for now’….which really means until the end of time. There’s no telling WHAT I’ll find in there (Maybe some of those damn calendars!!). Have my taxes to the accountant before July…..EVERY SINGLE YEAR, I say I’ll have them to her by February ~ bwahahahaha ~ not even close. Maybe I’ll shoot for May to avoid all the pressure of the April 15 deadline ~ can we say Extension??? 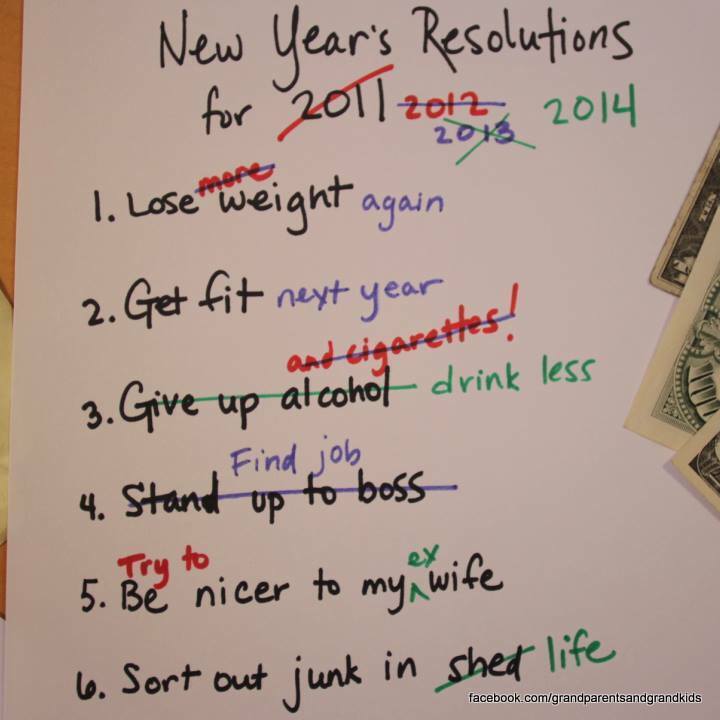 So, that’s my list of “Suggestions” ~ not Resolutions ~ and I feel pretty damn good about them. There’s even a chance some of them might happen….but if not that’s ok, to0. My hope for each of you is that you have the New Year YOU want, whatever that may be. Thank you SO much for hanging out with me, making me laugh and laughing along with me. Cheers to you all ~ here’s to a Flippin Fabulous 2014!!! Previous I Learned Something This Weekend…. Next Sure, Pull My Financials ~ I can’t WAIT to see what you find! Happy New Year! I stopped making “resolutions” long ago, because there was nothing to hold me accountable. So, this year I plan to clean out clutter BEFORE it accumulates. The rest (eating healthy, weight loss, winning the lottery, etc.) will sort itself out. Or not. Michelle ~ True, I would just say…’whatever’ 😀 So, I too will just do it as needed…maybe ~ Cheers ! Love reading your blog and post during the day, you always make me smile:) Keep them coming!! Nelda ~ Thank YOU so much for letting me know ~ So glad you’re hanging out with me ~ Cheers! Happy New Year to you as well. I really enjoy your blog. You’re a gifted comedian. Thanks for the many, many laughs during these past few months which have been mighty depressing for me. Bravo! Chava ~ Happy Happy Flippin New Year 😀 I am so very thankful for you reading my blog and that it makes you laugh…don’t we all need more of that! Cheers Girl!! Love the idea of “suggestions”! Happy New Year Ms. Sasha! !